Yeah, so that happened. On Monday, I went out to ride and when I was walking around the barn, I smelled this really bad, chemical smell. Hard to explain, but it was kind of like burning metal mixed with a meth house? I’d never smelled it before. A few of the girls were around and I was going to ask them if they smelled it, but it kind of wafted away and I forgot…Until a TERRIBLE headache slammed me. Like, unreal bad. I thought I was going to puke. It started so suddenly in the back of my neck that I thought I had tweaked something in my neck, and then moved up through my neck to my sinuses, which were throbbing really painfully. God, it was so bad. I didn’t connect the dots though, that bad smell= chemical poisoning. I grabbed two Advil, and went to ride Oats. He was being super great considering I had this awful headache, and by that time my nose and eyes started gushing…I warmed him up, we hopped over the x-rails set up in the ring, and then I just jumped off. I couldn’t handle it anymore, and the awful headache wasn’t lifting. I was kind of starting to stagger a bit and was having trouble focusing. Things were not good. I put Oats away and made it back to my car, and then home. Once home, I went straight to bed and lay down. I told my husband that I was NOT feeling well, and took 4 more Advil for some, if any, relief. It was soooooo bizarre?! The Advil did the trick by an hour or so, and I was able to be normal again, but still…WTF? Why can’t we do this instead? Photo courtesy of Nicole Gibby. The next day, I even had the remnants of a rebound headache from whatever poisoned me the day before, but thankfully it was easily remedied by like, 1 Tylenol, not 6 of them. Jesus! So, I called the barn owner and left a strange and cryptic voicemail saying there was this weird smell, that made me really sick, that I wanted her to be aware of. It was really windy that day, and what if it happened again- if a neighbour was burning something really toxic and the fumes carried? Anyways, I went to my dressage lesson with some trepidation yesterday. Poisoning, a rebound headache, returning to the scene…What was going to happen now? I had a tough but reasonably responsive dressage lesson with Karen in the indoor. It was cold again and pretty windy, so I didn’t feel like riding outside. We worked on some pretty intense walk work (which Oats and I struggled with), and then walk-canter work (again that we really struggled with), and on to some pretty decent trot. All in all, a good night. But man, what a way to start the week eh??? A repeated refrain from my jump/showing progress this past year has been: This feels good, I am making progress, but how do I know it will stick? Cute chestnuts all in a row last night! I felt tentative. Wary. Used to riding a high and then having the rug pulled out from under my feet, courage and bravery-wise. I’m not used to taking advantage of my new perceptions and the hard work I’ve been doing to manage my anxiety. But you know what? I know I go through this every year, but this year I’m feeling VERY positive. Are our rides perfect? Hellllll no. Are the fun? YES! Do I feel like each lesson, despite what actually happens during the lesson, I am working toward my goals? Definitely! And that’s all I should be happy with. And I am! Last night we worked on some things I typically cringe about doing: gymnastics (ugh!) 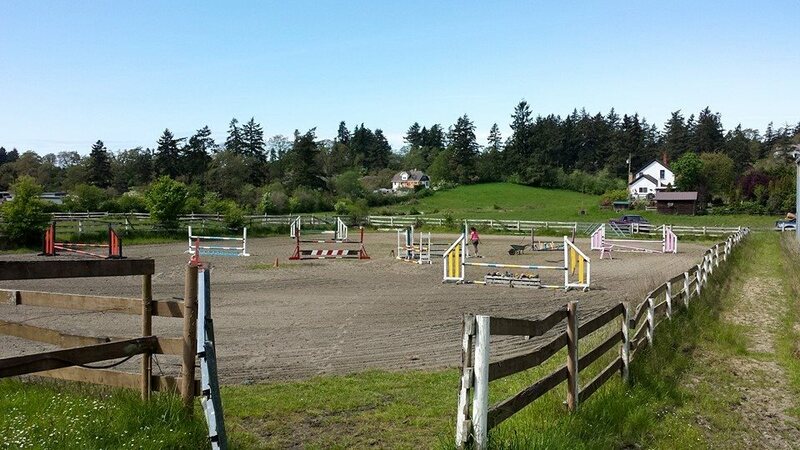 a 2’3” oxer- actually I am getting way more reasonable about this, and it was fine, and a circle jump- no prob! And a bending line- 1 awkward run through it where Oats and I got kind of confuzzled, and then we ran through noooo probs. The gymnastic was simple, trot-in x-rail to a 2-stride vertical. The vertical eventually went up to between 2’6”-2’9” and it rode really nicely. Not something I take for granted in my world, hahah. The vertical also became the 2nd fence in the bending line, so it got bumped down when we approached it. Oats has also been working hard on helping me out with his changes, he now gets the front regularly but also gets the back late. Still, this is more than he has offered in the past and he has started offering them much more regularly, so go OATS! And the sunny weather has done much to improve my outlook on life. It was almost 20 degrees yesterday! 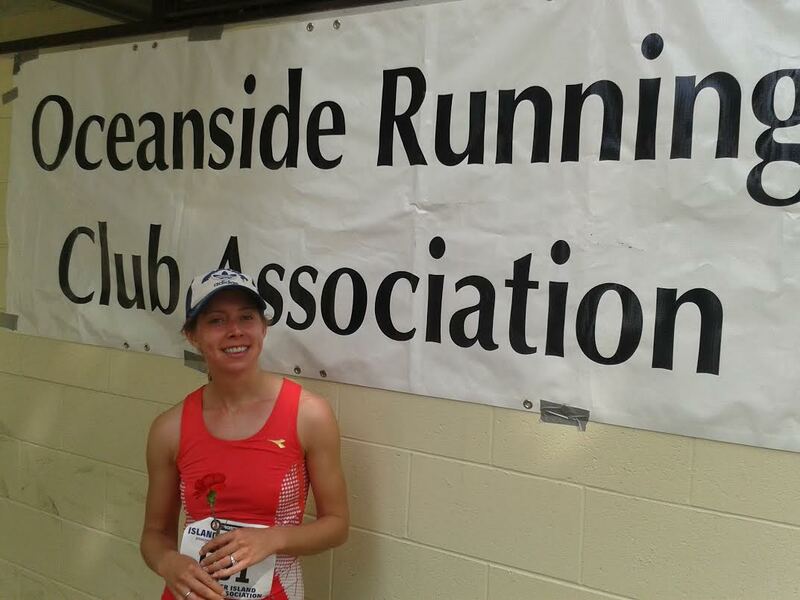 Race Recap: Oceanside Mother’s Day 10k! A big ego boost of a weekend. Not a personal best, but a good day nonetheless! Woah- let me just say that I really love smaller community-run races. They are so much cheaper (entry fees are typically $20-25 in advance, maybe $35 day-of), the food is good – better than what we normally have at the TC10k – and the volunteers are awesome! And at the finish, they gave you a carnation and a bottle of water! Lovely. 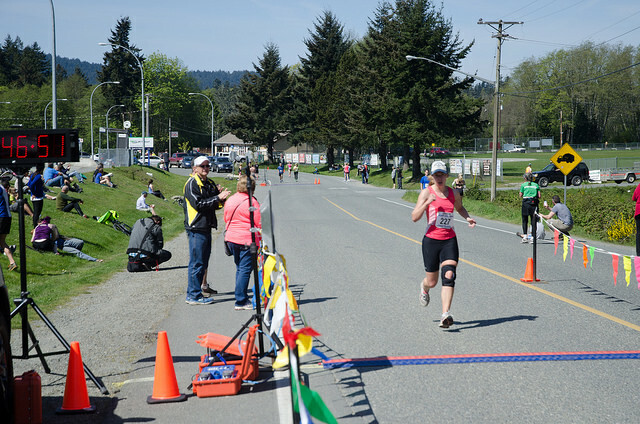 I had mentioned at my last race (Sooke 10k) that while I was lucky enough to finally place, I had also won a draw prize for another 10k race- the Oceanside Mother’s Day 10k. So, even though my last 10k was kind of a killer and I was swearing up and down I was going to take a break…I was now signed up for another one! Silly me. 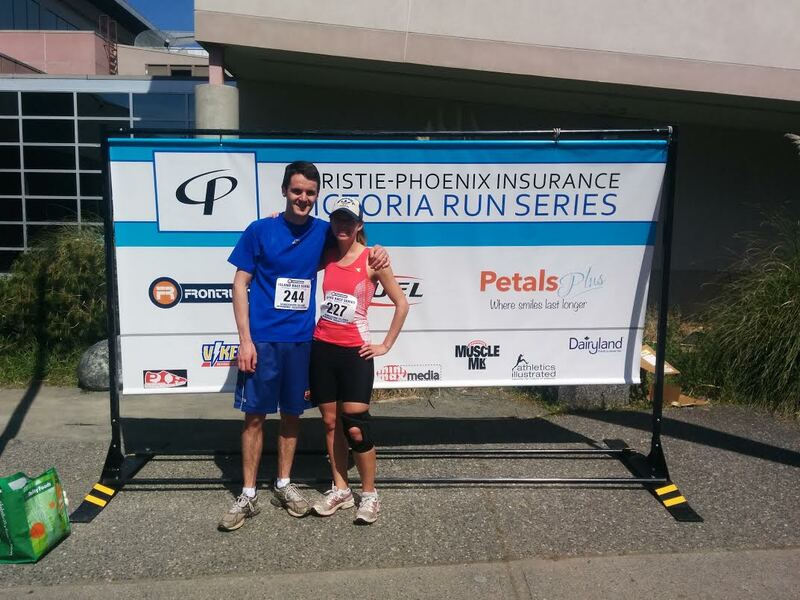 My husband ran with me, and the course was really nice. Good variety of terrain and not too technical, we ran across a small bridge, down a hill to Rathtrevor Park, and out to the ocean, and we ran along the ocean for a bit on gravel, and then back through the park. I think this run had some of the loveliest scenery, and probably the most race-marshals marking the route haha. We really enjoyed the slight breeze off the ocean, and the hilarious stares of campers going ‘WTF’ are these people running like idiots through the campsites!! It was cool in the trees, and overall not a warmer day, which worked to our advantage. It would have been an excellent race to try for a personal best, but for some reason I just wasn’t 100%- I was struggling to rate my breaths, and I felt like I was gasping a lot more than I should have been. I have been trying to start out faster, and then work to try and hold my pace for longer (like 5k or so) but I started dropping faster and by 6k I was like ARGHH…I’m dying…. Way far back you can see us! Photo courtesy of Terry Riggs. BUT everyone else was a bit slower- soooo I got the happy cheers of volunteers shouting to me that I was the second woman!! Yeah! That has NEVER happened to me, as I am still fairly new at racing, having started just this year. So, we kept pushing forward. I lagged bigtime at 6-7k, got a big ego boost from the volunteers and went through to 8- struggled up the very short hill, and then held fairly strong from 9 to the finish. No sprint at the finish, but I did feel like it was a good pace, and one we held well for the last kilometer. We finished at 47:25, which was slower than my last 10k time (I know I can’t get PB’s every time I’m out…) but good enough to place me as the 2nd woman overall, and 1st in my age group! Yeehaw!!! I do have to note though that this race was far less competitive (a fun run) than the ones I have run overall this year- that is certainly why I placed where I did, NOT because I have somehow inexplicably become a super-runner. Thanks, as always, to the lovely folks who take time to organize, volunteers and run in these races- I’m learning so much at each one, and enjoying the challenge. The beautiful outdoor. Photo courtesy of Sarah C.
We’re back in the outdoor and enjoying every moment of it! It officially opened this week for lessons and so Oats and I rode in it Wed and Thurs (lesson day). He was a bit foot-sensitive, so he is getting shoes next Thursday to help him out. And I have to say that while I LOVE riding in the outdoor and it feels soooo nice to get out in the fresh air and out of the dusty coal-miner tin can (indoor), riding/jumping outdoors is tough! I felt tired, very tired. After jumping 1 course, I was out of breath, and felt weak. And I am no slouch in the workout dept., I mean I am racing a 10k this weekend after all and have been racing all winter, ha. We started off dealing with the right-bend issue at the trot, then the canter (this issue would resurface throughout the lesson, because I am apparently incapable of dealing with more than 1 thing at a time when jumping- and it very quickly becomes THE JUMP!). Then, we worked over a small gymnastic, x-rail to 3-stride small vertical, and then added in a small bending line to a pink x-rail- then vertical because Oats found it very easy. And then we brought it all together into a mega-course [felt mega to us, because there were 10 whole jumps in it!]. We did the course twice, and I had the option of doing it a 3rd time but wimped out – was feeling tired and kind of weak- but next time..oh next time, I’ll woman up and I’l do it!! I was quite pleased with how the course went, the jumps were small and manageable except for one oxer on the diagonal that started to eat my soul…Ha. Oh and the line that I bungled EVERY time we went over it. 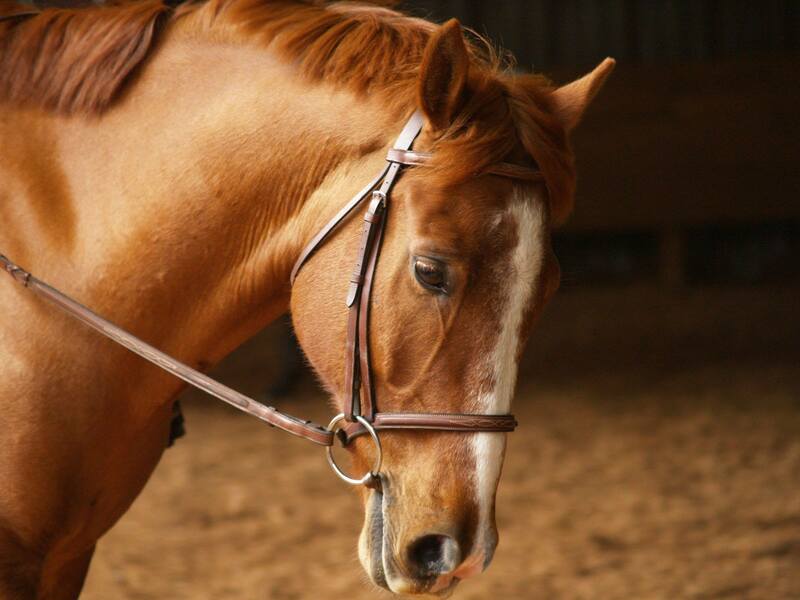 By the time we’d get to it, I’d be tired and start kind of….not riding…so instead of the good 6 strides, we’d chip, land in a heap, and pull out a weak 7-strides. Both times! Gah! I’ll figure it out next time haha. So, straightness and bend were problems…my position was pretty good, and the gymnastic and for the most part, other bending lines rode very nicely! Mr. Handsome- photo credit to Hannah R.
Then I clued in that he most likely was feeling sore and out of it. Fair enough, Oats. I let him graze for about an hour in the outdoor arena while I worked on it, digging up grass clumps. I do think he had the better part of the deal though! 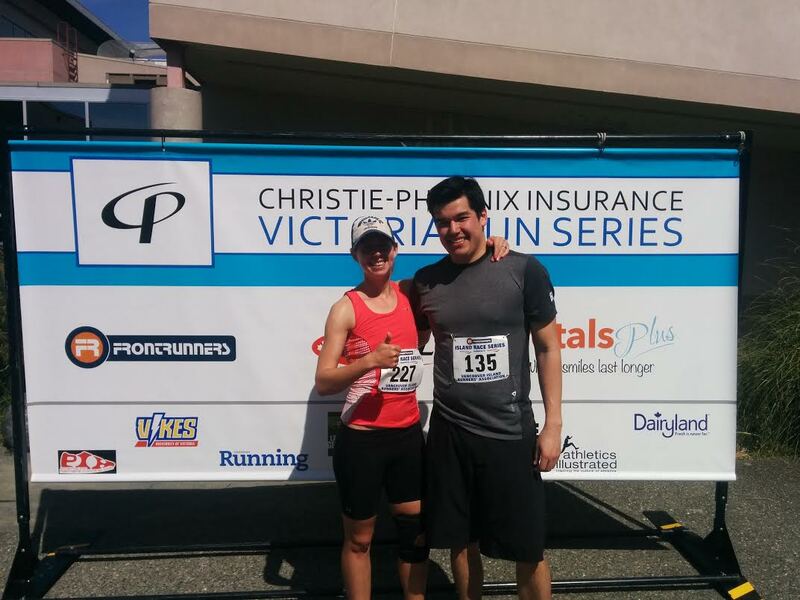 I went for a fairly good 15k run with my husband on Saturday after I finished riding and working in the outdoor. In retrospect I was running on legs that were already feeling tired. I was complaining on Friday that I felt tired, really tired. Like, I came home and lay down- on a Friday?! I was THAT tired, I guess. So, running on Saturday after riding and digging in the arena was probably a bit much but it felt pretty good. AND I saw a seagull fish a crab out of the ocean and start smacking it around. The poor crab didn’t stand a chance, even when the seagull dropped it a few times! Sunday, I tried again with Oats and he still felt very ‘eh’. His canter was improved, but his trot got worse. He could.not.bend.right. for the life of him! I tried everything, and he cranked his leaning to the left. It was frustrating…And yet again, I figured it was stiffness due to the vaccination. I guess it was just hitting him harder than usual? So, two days of me feeling like I don’t know how to ride my pony, and don’t know how to run anymore either. Positive progress? It’s a bit of a game of snakes and ladders, haha! 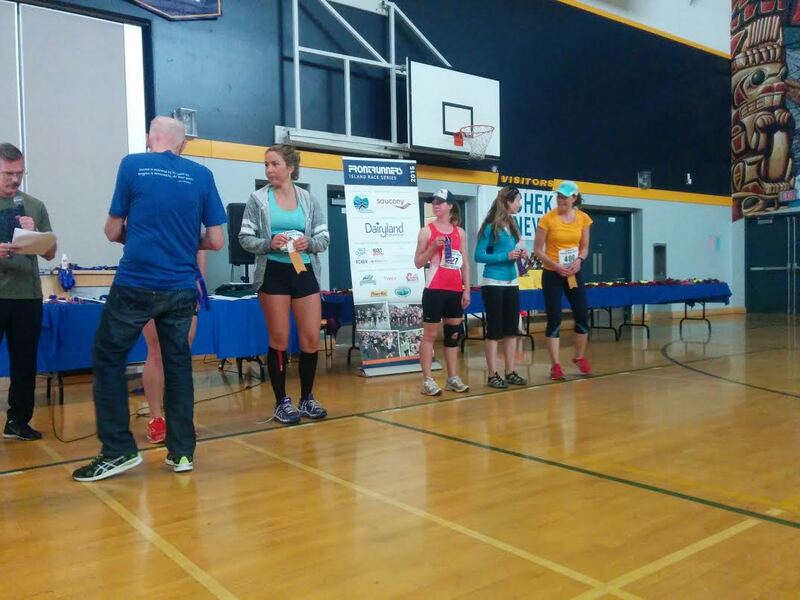 Race Recap: Sooke River 10k- and series finale! I bought new run shorts (Underarmour) and a summer shirt to race in and boy I am glad I did…it was HOT! A side note about shorts here: I hate them. Hate them! Even when I asked for the best shorts that DO NOT ride up, I ended up getting some crotch chafing that made riding Oats later in the day a mildly unpleasant experience..gRRRRRR…back to the drawing board of maybe running in basketball shorts again! It was NOT an easy run. I started out fast. I usually start pretty slowly, and to me it felt like I was tearing it up! At a dead run! (not really, but you know, fast). I kept it up and had the dawning realization that to get the time I wanted- the vaunted, unheard of speedy time of oh, 47:50 or so, I was going to have to run gasping for breath pretty much the whole time. That pace leaves you breathless, basically. It was an uncomfortable realization. So, I ran and ran, feeling like I was out of breath the entire time. I coughed up pghlegm most horribly, and coughed it out on my arm, that ended up smeared across my dratted shorts. My friend and I ran together, and he was running even faster than me! It was crazy. We got to the turnaround point (it was an out-and-back course) and he was ahead of me by a bit. On the way back, all I could think about was the hills. Oh, the mild (when you’re not dying and gasping for breath) hills…That looked so innocent from the way down them, suddenly felt like I was crawling up Mt. Everest. My pace died down, I was still gasping and muttering and cursing. My friend opted to walk the hills due to a nagging injury (wise move). The group that I was catching up with started rapidly being in the distance. They were way outpacing me and I could not keep up. I was all alone, all of a sudden. I was waving at spectators in hopes they would cheer me on a bit more (I needed the encouragement!!!). It was hot, I wanted to stop for water but instead gunned myself on a bit more. Every step felt like I was pulling myself along. All I could think about was stopping. Maybe walking. Maybe never having to run a 10k ever again even?? Finally, after a feeble wave at some spectators who dutifully cheered me on (god, I must have looked like I needed it), the course volunteers were waving me on to the final turn where I ran blindly looking for that 100-m sprint lined with flags. FINALLY!!! A photo where it actually looks like I’m running. I think the spectators really got me going at this point. Some guy who looked like a coach was shouting at me ‘Go girl, get it!! !’ So I (feebly again) cranked it up and went for it!! I saw Ian on the sidelines and gave him a panicked, worried look, haha. I sprint-crawled through the finish line and saw the finish time- 46:52– ME? I got that time? Wha? 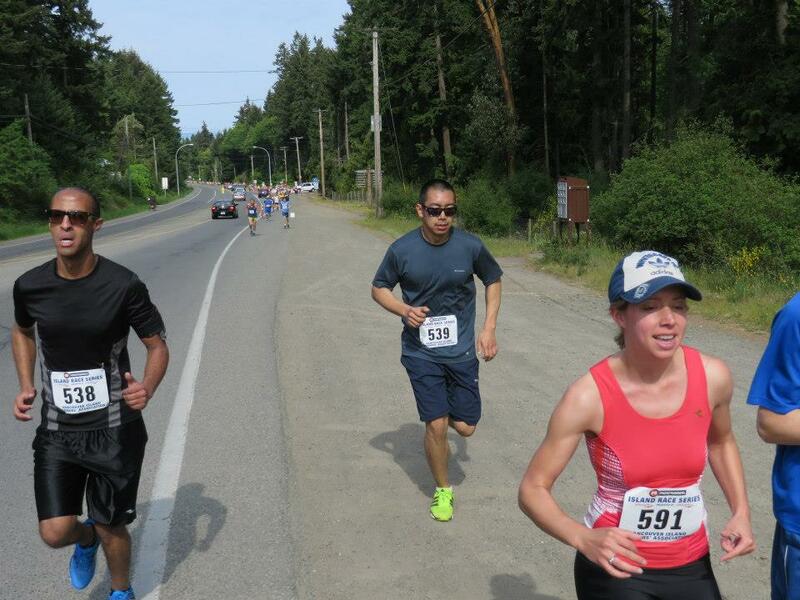 My previous best time for the 10k was also this year- at the Cobble Hill race. I was gunning for a sub-50 minute 10k and I got it (49:something) and was totally overjoyed!! And now I was beating my previous PR time out of the water??? After I caught my breath, basically reeling around thinking about grabbing onto a tree or maybe a fence to stop myself from falling over, I was SO GLAD. I really pushed myself, harder than I ever had- and I did it! I was exhausted, my lungs hurt and I was covered, head to toe, in sweat. 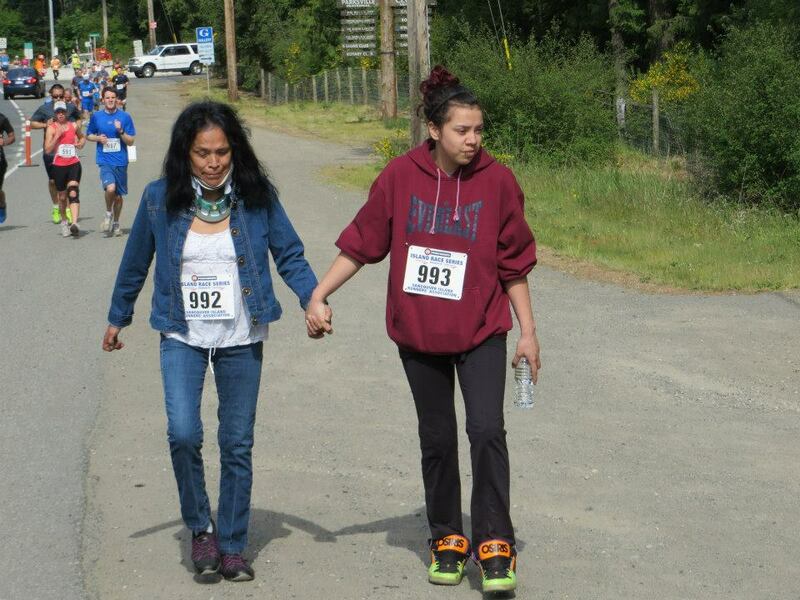 Great work VIRA- You run good races, fabulous volunteers and the best part? The food! 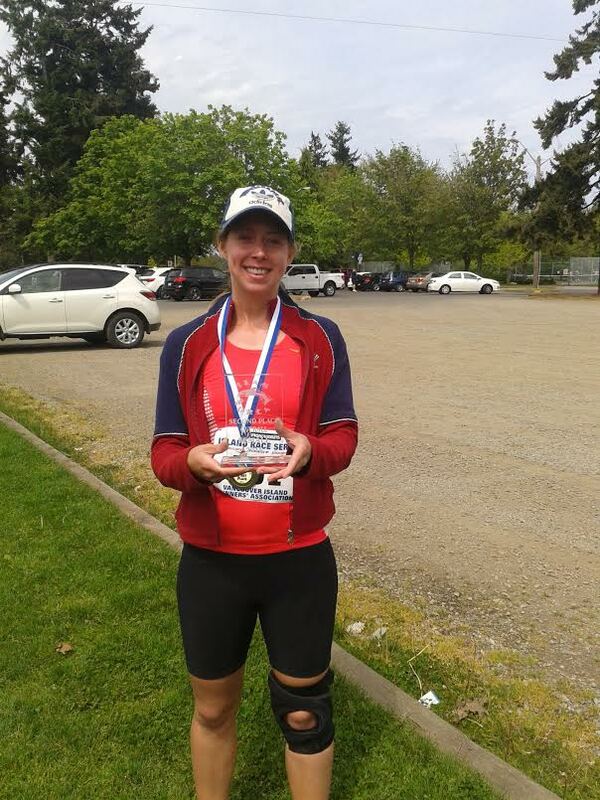 The sandwiches at Sooke were so awesome, and they had my favourite protein drinks, cookies and yogurts. I’m glad to be taking a break for a bit, but I know I’m going to really miss that rush of racing. And to cap it all off- I was 6th out of 25 in my age group, Ian was 3 out of 10 and Jared was 8th. 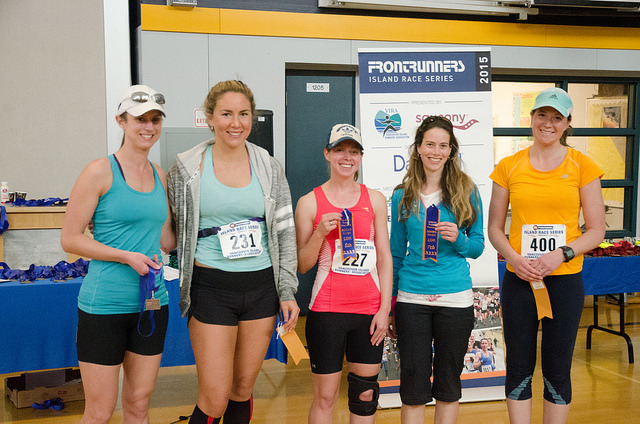 A lovely way to finish, AND I won the draw prize for a free entry to the Oceanside Mother’s Day 10k in May. Which I have already registered for! (I guess that promise to myself of never running another 10k was kind of a lie to keep myself going…! ).